Hope we are all okay today! I literally squealed with excitement when the postman handed me this, this morning! 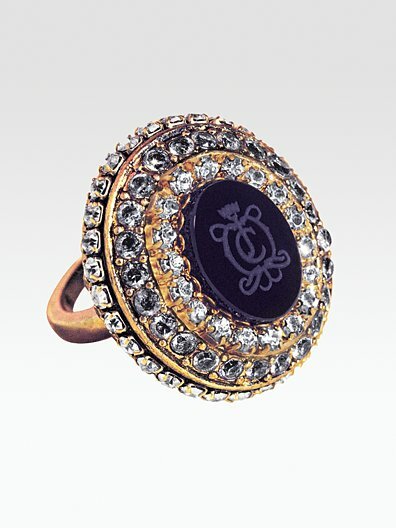 It was instant love at first sight, ladies i give to you, the Juicy Couture 'Couture Couture' Solid Perfume Ring. 'This Valentinges gift for Juice girls on the go! Slip this adjustable solid perfume ring around your finger for at-whim perfume touchups! This isnt a new scent from Juicy Couture, it is one of their perfumes from their collection and i must say even though i had never smelt it before, it is actually gorgeous! You swivel around the top to reveal the solid perfume. It makes me want to pick up a full size bottle! The ring is blingtastic, and i personally would wear this ring on an evening as i love big, bling cocktail rings! I also love the packaging that it comes in, typical Juicy Couture! This would have definitely been at the top of my Valentines day list! I think its gorgeous & would make a lovely present! Im sure that i will be wearing this ring & smelling of Couture Couture for the foreseeable future! It will retail for £35 and it is Limited Edition. This is available from the 1st February from Boots, Debenhams, Harrods, House of Fraser, John Lewis, Selfridges, The Perfume Shop and The Fragrance Shop. Will you be picking this beauty up? This is tooooo weird..i got this in the post this morning and was literally jumping up and down with excitment, i then tweeted i had something exciting to blog about and then i just saw your post now hahahaha!!! We are twins in disguise hun!! Thank you SO much for your comment! haha i was literally the same babes! I was squealing! I am pretty much in love with it! haha i cant quite get over how similar we are! Its crazy but a bit amazing at the same time! haha! Saturday is gunna be amazing! I cannot wait to finally meet you my darling! Wow what a lovely surprise in the post. Looks gorgeous, love a blingy ring so it's a bonus with the perfume! Gorgeous ring! I think I may have to get one! Is it quite a good size that it can fit on any finger? So cute. x hivennn. p.s enter my jeffrey campbell giveaway? Wow this is gorgeous, I want!!! Really beautiful ring as well. Illamasqua Throb Collection - Out Now!